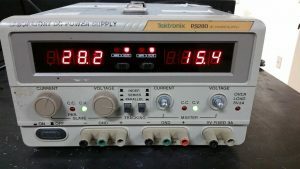 The power supply unit is the part of the hardware that is used to convert the power provided from the outlet into usable power to many parts inside an electrical device. Every energy supply must drive its load, which is connected to it. Depending on its design, a power supply unit may obtain energy from various types of energy sources, like electrical energy transmission systems, electromechanical systems such as generators and alternators, solar power converters, energy storage devices such as a battery and fuel cells, or other power supply. There are two types of power supplies existed, AC and DC power supply. Based on the electrical device’s electric specifications it may use AC power or DC power. 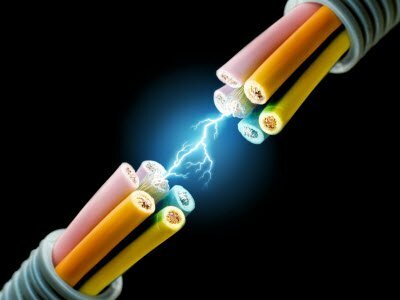 The power supply can be defined as it is an electrical device used to give electrical supply to electrical loads. The main function of this device is to change the electrical current from a source to the accurate voltage, frequency and current to supply the load. Sometimes, these power supplies can be named to as electric power converters. Some types of supplies are separate pieces of loads, whereas others are fabricated into the appliances that they control. The Power supply circuit is used in various electrical & electronic devices. The power supply circuits are classified into different types based on the power they utilize for providing for circuits or devices. 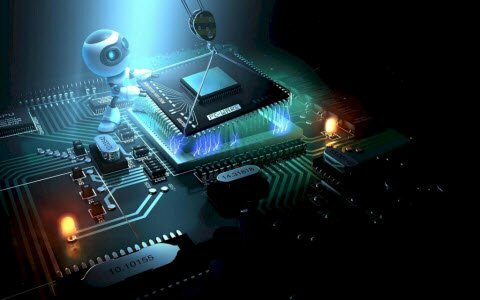 For instance, the microcontroller based circuits are generally the 5V DC regulated power supply (RPS) circuits, which can be designed with the help of different method for changing the power from 230V AC to 5V DC. The power supply block diagram, and the step by step conversion of 230V AC to 12V DC is discussed below. A step-down transformer converts the 230V AC into12v. A capacitor is used to filter the AC ripples and gives to the voltage regulator. Finally voltage regulator regulates the voltage to 5V and finally, a blocking diode is used for taking the pulsating waveform. Here we will discuss different types of power supplies which have existed in the market world. The below table tells the basic types of power supplies for following conditions. The different AC voltages are generated by using a transformer. The transformer may have multiple windings or taps, in which case the instrument uses switches to select the different voltage levels. Alternatively, a variable transformer (adjustable autotransformer) can be used to continuously vary the voltages. Some variable AC supplies are included meters to monitor the voltage, current, and/or power. Unregulated power supplies contain a step-down transformer, rectifier, filter capacitor, and a bleeder resistor. This type of power supply, because of simplicity, is the least costly and most reliable for low power requirements. The main disadvantage is that the output voltage is not constant. It will vary with the input voltage and the load current, and the ripple is not suitable for electronic applications. The ripple can be reduced by changing the filter capacitor to an LC (inductor-capacitor) filter, but the cost becomes more. The input transformer is used to convert the incoming line voltage down to the required level of the power supply. It also isolates the output circuit from the line supply. Here we are using a step-down transformer. The rectifier used to convert the incoming signal from an AC format into raw DC. Please refer these links, Different types of rectifiers available are half wave rectifier and full-wave rectifier. The pulsated DC from the rectifier is fed to the smoothing capacitor. It will remove the unwanted ripples in the pulsated DC. Bleeder Resistor is also known as a power supply drain resistor. It is connected across the filter capacitors to drain their stored charge so that the power system supply is not dangerous. This type of power supply permits remote control for its operation via analog input otherwise digital interfaces like GPIB or RS232. The controlled properties of this supply include current, voltage, frequency. 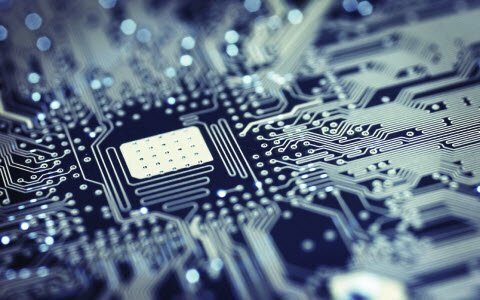 These type of supplies are used in a wide range of applications like fabrication of semiconductors, X-ray generators, monitoring of crystal growth, automated apparatus testing. It also controls over-heating through controlling voltage, which may modify manually or automatically based on the power supply. 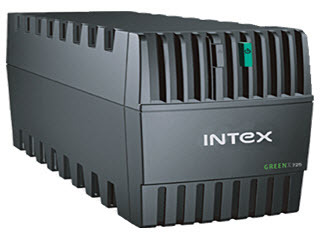 The PSU or power supply unit is also called as a power converter or a power pack. In a computer, the internal components like cases, motherboards, & power supplies all available in different configurations, sizes which are known as form factor. All these three components must be well-matched to work appropriately together. 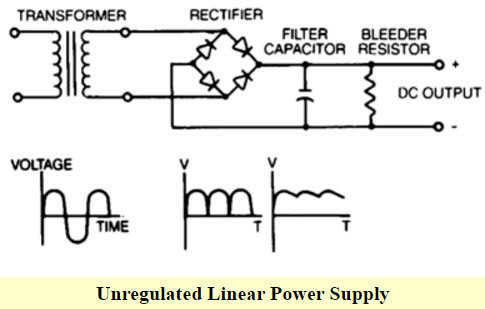 Regulated linear power supplies are same as the unregulated linear power supply except that a 3-terminal regulator is used in place of the bleeder resistor. The main aim of this supply is to provide the required level of DC power to the load. The DC power supply uses an AC supply as the input. Different applications require different levels of attributes voltages, but nowadays the DC power supplies provide an accurate output voltage. And this voltage is regulated by an electronic circuitry so that it provides a constant output voltage over a wide range of output loads. 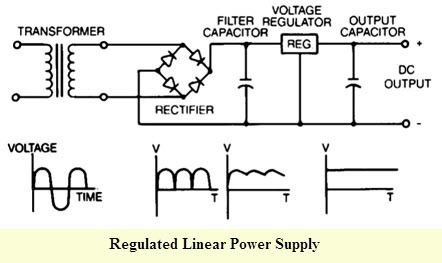 Here the basic circuit diagram for Regulated Linear Power Supply given below. 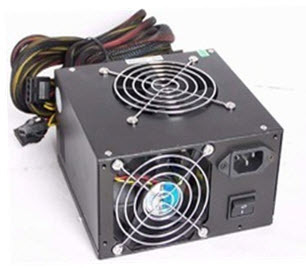 The main features of this power supply include the following. The magnetic materials used in this power supply are CRGO core or Stalloy. It is more reliable, less complex and bulky. It gives a faster response. 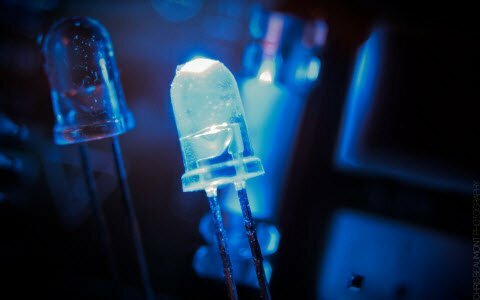 These are best for several low power applications as a result when a high-power is required; the drawbacks turn into more clearly. The disadvantages of this power supply include a high loss of heat, size, & low-efficiency level. Whenever linear power supply is used in high power applications; it requires large components to manage the power. Once rectified from an AC signal, the DC needs to be smoothed to remove the varying voltage level. Large value capacitors are generally used for this purpose. A linear regulator has an active (BJT or MOSFET) pass device (series or shunt) controlled by a high gain differential amplifier. It compares the output voltage with a precise reference voltage and adjusts the pass device to maintain a constant level output voltage. There are two main types of linear power supplies. 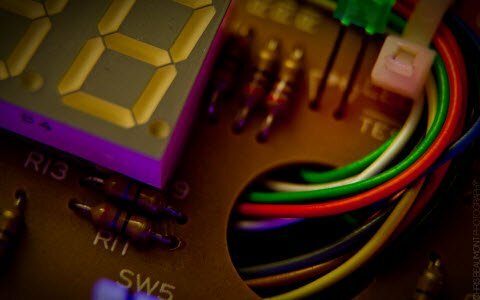 Read more about Different Types of Voltage Regulators with Working Principle. This is the most widely used regulators for linear power supplies. As the name implies a series element is placed in the circuit as shown in below figure, and its resistance varied via the control electronics to ensure that the correct output voltage is generated for the current taken. The shunt regulator is less widely used as the main element within a voltage regulator. In this, a variable element is placed across the load as shown in below. 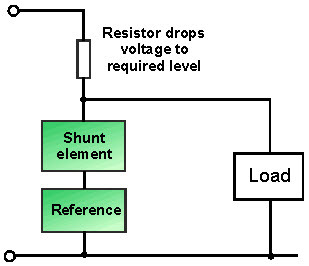 There is a source resistor placed in series with the input, and the shunt regulator is varied to make sure that the voltage across the load remains constant. The SMPS has a rectifier, filter capacitor, series transistor, regulator, transformer, but is more complicated than the other power supplies that we have discussed. The above-shown schematic is a simple block diagram. The AC voltage is rectified to an unregulated DC voltage, with the series transistor and the regulator. This DC is chopped to a constant high-frequency voltage which enables the size of the transformer to be dramatically reduced and allows for a much smaller power supply. The disadvantages of this type of supply are that all of the transformers have to be custom-made and the complexity of the power supply does not lend itself to low production or economical low power applications. Please refer this link to Know All About SMPS. UPS is a Backup power source that, in the case of power failure or fluctuations, allows enough time for an orderly shutdown of the system or for a standby generator to start up. UPS consists usually of a bank of rechargeable batteries and power sensing and conditioning circuitry. Furthermore read about the UPS circuit diagram and different types, please refer this link to read more about UPS Circuit Diagram and Working. A DC power supply is one that provides a consistent DC voltage to its load. Based on its plan, a DC power supply might be controlled from a DC supply or from an AC supply like the power mains. 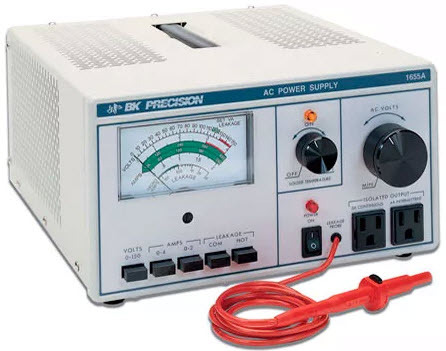 This is all about different types of power supplies which include linear power supplies, switching mode power supply, uninterrupted power supply. 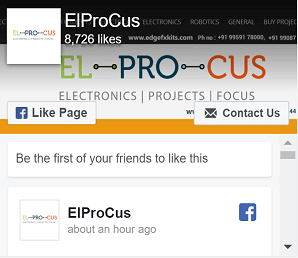 Furthermore, to implement electronics and electrical projects or any information regarding the types of power supply fell free to give your feedback to give your suggestions, comments in the comment section below. 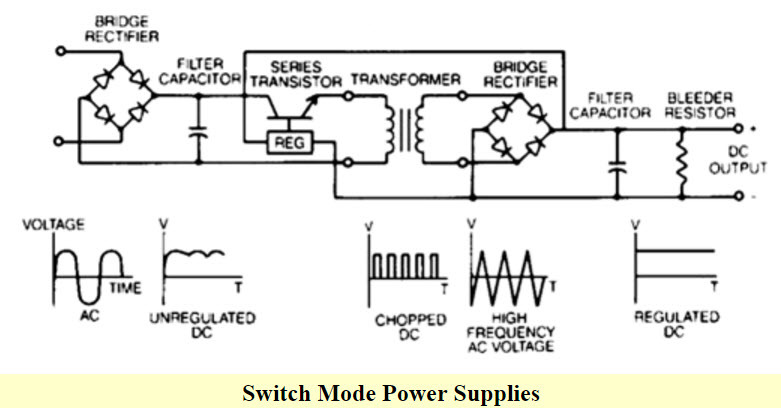 what is electric power used in linear power supply ,switch mode power supply and with what ? A linear RPS regulates the o/p V by dropping excess voltage in a series dissipative component and they use a complex regulator circuit to achieve very low load and line regulation. Linear regulated power supplies also have very little output noise and very little ripple.